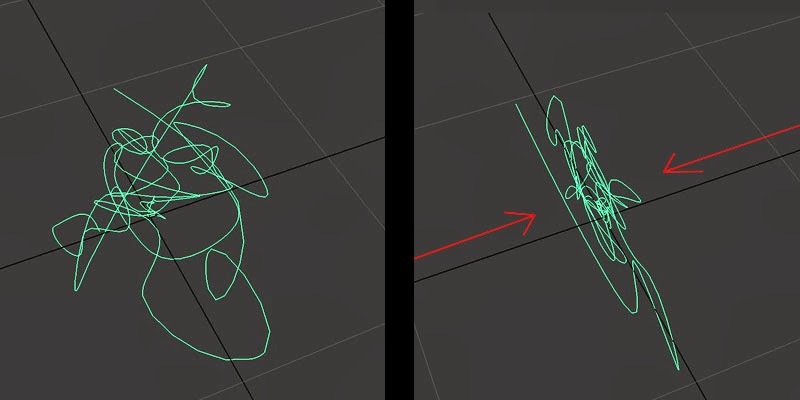 Now we have the data available in Maya (as both animation and nurbs curves), the next step is to derive as many interesting shapes and designs from it as possible. I have been able to come up with a few techniques. 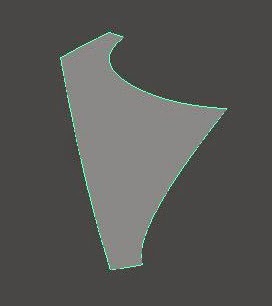 The following technique offers a way to potentially generate an infinite number of shapes from the curve data. Looking at just one of the many 3D curves we have can reveal many different shapes within the intersecting lines, however depending on the angle you look from, it will appear different, and dramatically change the look of the curves and shapes within. The screen shot below shows the same curve from three different angles, clearly demonstrating this effect. By placing one of these curves into a group and scaling the group down in one axis, we can generate a flattened curve, representing what the curve would look like from that angle. By rotating the curve from within the group we can quickly preview the flattened curve from any angle. The trick is how can we quickly break the curve into individual pieces at every point the lines intersect. Once we can do that we can build the individual shapes. If we do a surface planer operation on the flattened curve, it will fill in the entire shape with a flat surface. 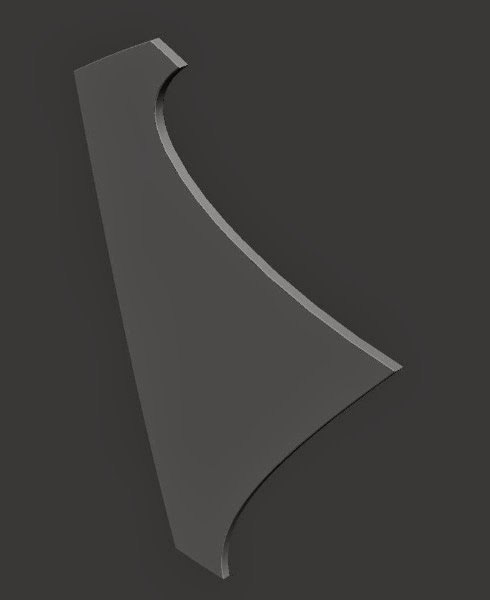 We can then go into the Trim Edge mode for nurbs surfaces, where we can then select different intersecting lines to extract the individual curve pieces. 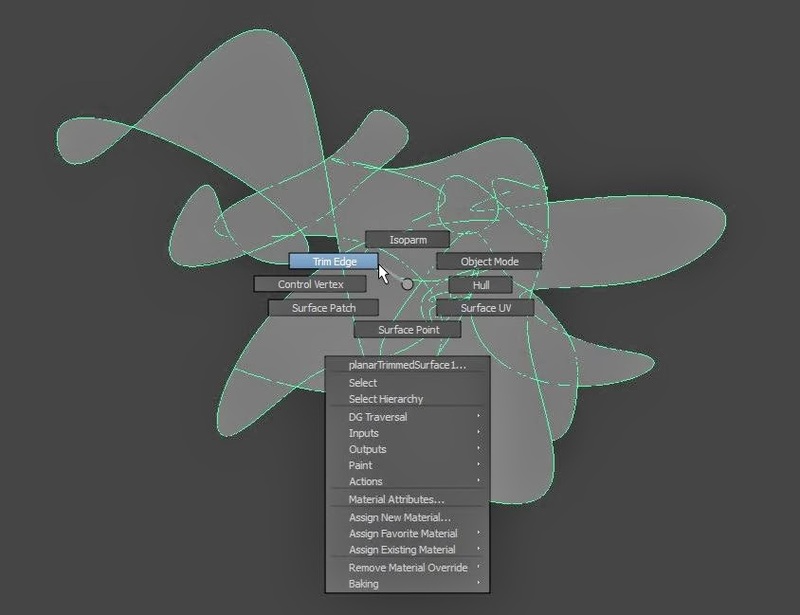 We use Duplicate Surface Curves in the Edit Curves menu to do this. We could select all the lines at once and get every piece of curve or just select the ones we need. Either way, once we have the curve pieces extracted we can select whatever we need to make a shape and use the surface planer operation to build it. From here we can convert to polygons and extrude it and do whatever else we can think of. If we were to gather enough of these abstract shapes, we can use them to create more complex sculptures. A more straight forward interpretation of one of the 3D curves is to simply extrude a shape along its path. In this example I extruded several smaller shapes to create a brush stroke look. I suppose we could use the shapes generated from curves with the technique I explained above. I created this coloured version, by using the samplerInfo node to sample the world space location (i.e. x,y,z became the new r,g,b values) and finished off with some colour remapping. In this one, I wrote a quick script to duplicate the profile shape along the path and adjusted it's scale based on another piece of animation data. By lofting the duplicated profile curves in the correct order, we can create a shape that follows the path while also varying the width of the path at the same time. After the extra effort to get something more interesting I don't think it notices that much! And here's a coloured version, same as the last example. Since I haven't posted the following anywhere else yet, I will also include this experiment. This was achieved before we even had the final .csv script, and shows what can be done with a particle simulation. In the following example I attach a particle emitter to one of the pieces of animation data, to trace the path with particles. 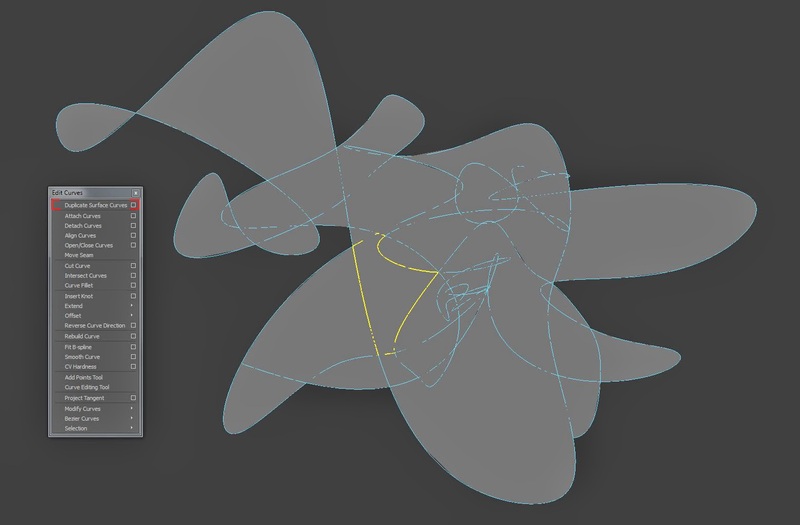 I then generated a blobby mesh, which gets smoothed/averaged to clean up the shape. The particles die after a set period of time so as you play through the simulation, you're viewing a segment of the data as time goes on. While I've only shown a few examples in this post (it's been more focused on techniques), I think they are good starting points to generate more designs! Fascinating, Ethan! Really interested by the 'filled in' shape route - If you created enough of those 'slices', could we think about creating a sort of IKEA 'flat-pack' construction - wherein the different profiles are slotted together to recreate the 3D dimensional version? Another thought: the way you've aligned colour with the xyz... I'm wondering, for example, could you some align width/thickness of the profile with the decibel volume of the Requiem itself? So quiet = thin and loud = fat? It would be another way of pushing the Requiem itself back along its own curves? I think we could use another recording of the Requiem - from a CD, for example, to generate the volume data, so we're closer in quality to the real thing? Anyway just thinking out loud here!